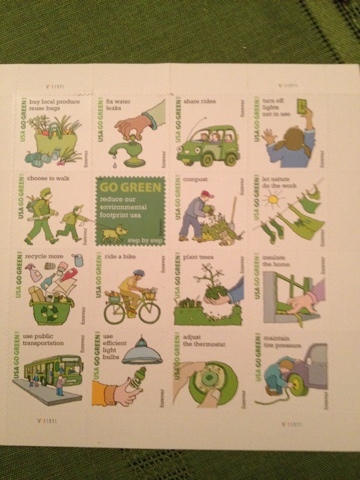 I found these Go Green stamps at the Adelphi post office today while I was there mailing the deposit for our new apartment. I feel I should mention the postal workers there were sweet as pie. One worker gently guided me to a two day mail envelope. The woman behind the window called everyone "baby" and "sugar" and wished me a great weekend with sincerity. Another worker took the time to notice and explain to an old woman she had a slip for UPS or "the brown trucks" before she waited on line for 15 minutes. Love is in the air in 11238.